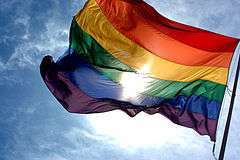 A gay anthem is a popular song that has become widely popular among, or has become identified with, the gay community, particularly gay men, although some of these songs may also become anthems for the rest of the LGBT community. Multiple top-charting popular songs, such as "Raise Your Glass" by Pink, have become a "refuge of unambiguous support for gay rights". Not all songs labelled as "gay anthems" were written with that purpose, but they are included in this subgenre of popular music if they have become particularly popular among the gay community. The lyrics of gay anthems are often marked by themes of perseverance, inner strength, acceptance, pride, and unity. Ten elements were identified by the editors of the 2002 book Queer, which they claim describe themes common to many gay anthems: "big voiced divas; themes of overcoming hardship in love; “you are not alone;” themes of throwing your cares away (to party); hard won self-esteem; unashamed sexuality; the search for acceptance; torch songs for the world-weary; the theme of love conquers all; and of making no apologies for who you are." According to Popular Music, a music journal, the song most commonly identified as a gay anthem is "I Will Survive" by Gloria Gaynor. The song is described as "a classic emblem of gay culture in the post-Stonewall and AIDS eras and arguably disco’s greatest anthem." UK LGBT rights charity Stonewall named Christina Aguilera's "Beautiful" the most empowering song of the 2000s decade for LGBT people, and Elton John predicted it would replace "I Will Survive" as the pre-eminent gay anthem. Diana Ross's "I'm Coming Out", ABBA's "Dancing Queen", Lady Gaga's "Born This Way", and "Y.M.C.A." by The Village People are also widely regarded as gay anthems, although not all of them were written with that purpose by their composers. ↑ Hawgood, Alex (November 5, 2010). "For Gays, New Songs of Survival". New York Times. Retrieved 21 April 2014. 1 2 3 4 Casserly, Meghan (February 11, 2011). "Lady Gaga's Born This Way: Gay Anthems And Girl Power". Forbes. Retrieved 13 August 2014. ↑ Hubbs, Nadine (May 2007). "'I Will Survive': musical mappings of queer social space in a disco anthem". Popular Music. 26 (2): 231–244. doi:10.1017/s0261143007001250. ↑ "Media: Current Releases". stonewall.org.uk. Retrieved 19 May 2013. ↑ "Y.M.C.A.byThe Village People". songfacts.com. Retrieved 21 April 2014.